Pilates (pi-LAH-teez), a movement system that uses spring driven machines as well as floor exercises to increase strength, flexibility, stamina, and concentration. Joseph H. Pilates 1880-1967, noted German inventor of the Pilates Exercise Method, originally called ‘Contrology’. 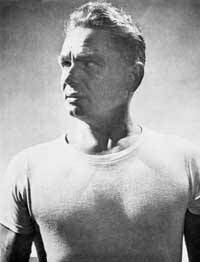 Joseph Pilates was born in 1880 in Düsseldorf, Germany. He devoted his life to the study of physical education, becoming an accomplished diver, skier, boxer, and gymnast before developing his fitness program of ‘Contrology’. He continued to teach and refine his system until his death in 1967.